Recently I read something about being an introvert that gave me so much insight into who I really am. I read that introverts don't dislike being around people, or being social, but they need quiet time to themselves to recharge. I love going out and partying, meeting my amazing and interesting coworkers, and spending time with old and new friends. But there gets to be a point where I just can't handle it anymore and I need to be alone. It's not that I'm unhappy around people, but it's about having the balance of socializing and revitalizing myself on my own. 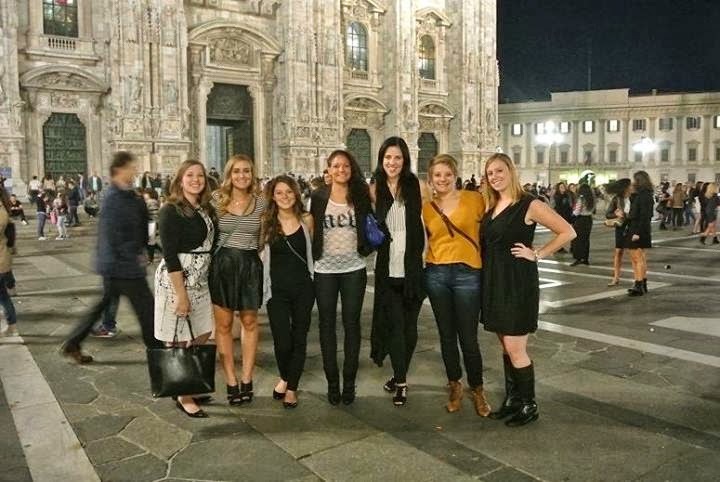 That said, I didn't move to Italy, completely away from everything and everyone I know, to hide away in my apartment. It was so packed full of people! This weekend after Friday's apartment crawl (more on that another day), I could feel myself getting sick and I felt so behind on absolutely everything (cleaning, unpacking, planning the curriculum, laundry... you know, exciting things) so I spent the rest of the weekend getting settled and honestly I feel a million times better. Before that, I hadn't had a day (I might have had ONE a few weeks ago) that I said "No" to plans and really let myself get back to a comfortable place. 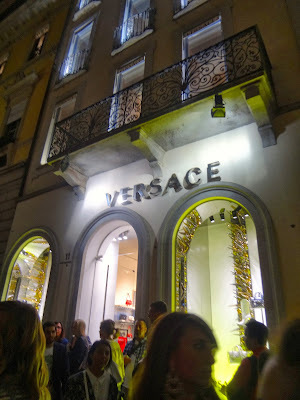 This week though, even though it was a school night, there were plans that might have been outside of my comfort zone but were just so amazingly necessary: Vogue's Fashion Night Out in Milan. Walking into the city at dusk was like walking into a different world. There were points where you could hardly move because the streets were so packed with the fashionable crowd that had flooded in, but at the same time you had no choice but to keep walking or else be trampled by everyone behind you. I've been in a few times now during the day and evening, but this wasn't even close. Every designer in the city had their shop open late. I can't say I saw a single person with a shopping bag but every store was jammed full. We were lured in by dance music played by live DJs, free Prosecco and hors d'oeurves being passed around on trays, and the important look of stores with bouncers outside. It was unlike anything I've ever seen. From what I've heard, this years Night Out wasn't quite as big or exciting as it's been in past years, but if that's the case I can't imagine what it must have been like. Apparently, amazing. There was an "anything goes" attitude towards clothes, leading to fun people-watching. Women wore heels I couldn't have stood in, let alone strutted down the cobblestoned streets in. Yet somehow the women in Chuck Taylor's, harem pants, and crop-tops looked just as amazing as those with Versace dresses and skyscraper heels. Mens fashion was something different, too. Having a few drinks before heading home for the night... those waiters were so good to us! Anyways, I really did debate going out for Fashion Night. I'm not a morning person at all and dreaded the idea of waking up the next day, and felt like I had a million things to do. It was such the right decision though! The people I'm meeting are so wonderful and fun- I got so lucky with this group! So I'm going to keep trying to put myself out of my comfort zone and enjoying this amazing experience. Woohoo!